Flower buds of the Red elderberry appear very early in spring, green at first they quickly take a bright violet or purple color. This apparition that sometimes occurs when there is still snow on the ground, brightens our woods, which at this time of the year, are rather monochrome. Long knew as a distinct species under the name of Sambucus pubens, it is now considered a subspecies of the Eurasia Red elderberry, distinguished mainly by its pubescent(hairy) shoots. 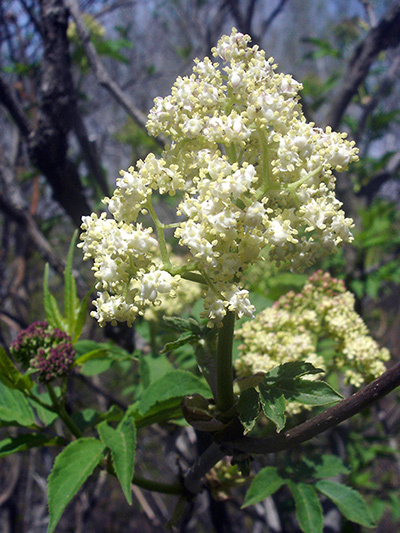 Red Elderberry is often in bloom before the leaves shows.